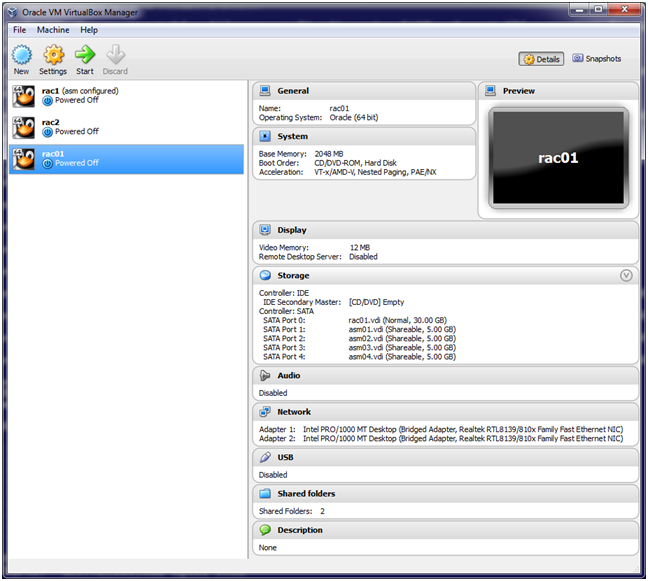 With help from oravirt, I was able to install RAC VMs. At this point, only the VM servers have been created and GI/DB are not installed; that’s coming up at some point. This is where the confusion was at first. There were some errors but seems to be working fine. Note: I used Git Bash this time around vs Window CMD. One improvements I would make if I ever or whenever get good enough on the subject is to have shared folders for linuxamd64_12102*.zip use existing locations. The way most vagrants are configure, will need multiple copies of the same binaries. Alternatively, edit VM shared folder manually. remote: Counting objects: 320, done. Receiving objects: 100% (320/320), 52.22 KiB | 0 bytes/s, done. Resolving deltas: 100% (210/210), done. remote: Counting objects: 2061, done. Receiving objects: 100% (2061/2061), 517.76 KiB | 0 bytes/s, done. Resolving deltas: 100% (954/954), done. ==> collabn2: Successfully added box 'kikitux/oracle6-racattack' (v16.01.01) for 'virtualbox'! ==> collabn2: Fixed port collision for 22 => 2222. Now on port 2200. ==> collabn2: Machine booted and ready! [collabn2] GuestAdditions versions on your host (5.1.18) and guest (5.0.0) do not match. http://public-yum.oracle.com/repo/OracleLinux/OL6/UEK/latest/x86_64/repodata/repomd.xml: [Errno 14] PYCURL ERROR 6 - "Couldn't resolve host 'public-yum.oracle.com'"
http://public-yum.oracle.com/repo/OracleLinux/OL6/addons/x86_64/repodata/repomd.xml: [Errno 14] PYCURL ERROR 6 - "Couldn't resolve host 'public-yum.oracle.com'"
http://public-yum.oracle.com/repo/OracleLinux/OL6/latest/x86_64/repodata/repomd.xml: [Errno 14] PYCURL ERROR 6 - "Couldn't resolve host 'public-yum.oracle.com'"
14: PYCURL ERROR 6 - "Couldn't resolve host 'mirrors.fedoraproject.org'"
collabn2: your host and reload your VM. ==> collabn2: wrote key file "/etc/rndc.key"
==> collabn1: Fixed port collision for 22 => 2222. Now on port 2201. ==> collabn1: Machine booted and ready! [collabn1] GuestAdditions versions on your host (5.1.18) and guest (5.0.0) do not match. collabn1: your host and reload your VM. ==> collabn1: wrote key file "/etc/rndc.key"
drwx------  3 vagrant vagrant 4096 Mar 26 13:10 .
drwxr-xr-x. 5 root    root    4096 Aug  4  2015 ..
Don't know password and not same as username. drwx------  3 vagrant vagrant 4096 Mar 26 13:14 . If anyone has successfully configured RAC Attack using Vagrant, I really would love to know how you did it. First, instructions are all over the place and I finally followed the one below. Does anyone know what the vagrant password is? collabn2: this with a newly generated keypair for better security. Installed the plugin 'vagrant-rekey-ssh (0.1.9)'! VM must be created before running this command. Run `vagrant up` first. Recently I came to know about Headless features for VirtualBox and was curious as to how it works. 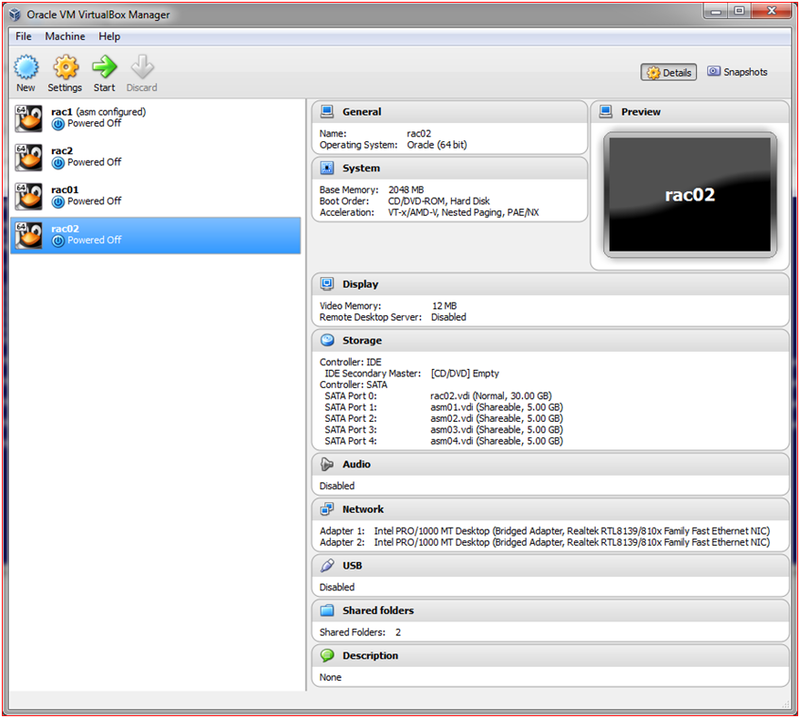 When using Headless, there is not a need to start VirtualBox GUI which is nice and removes clutters from Desktop. Here’s a demo on how to start VirtualBox Headless. VM "arrow" has been successfully started. VM was shutdown in the next step while connected. Connection to 192.168.56.11 closed by remote host. I am a lazy DBA. The less configuration I do the less chance I have to make a mistake. 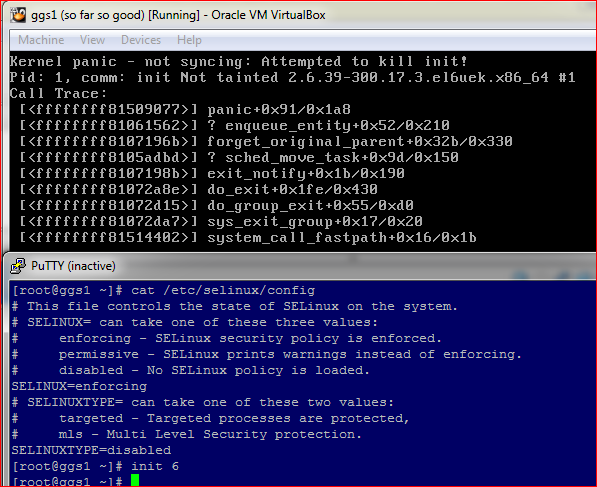 Surprisingly, oracle-rdbms-server-11gR2-preinstall does not configure pam.d/login and selinux. Here’s how to create kernel panic with incorrect configuration. At the same time, I need to slow down and read more carefully. Here is the super condensed version since there are already many blogs on how to install Linux on VirtuaBox. Be sure to change directory to where the disks are located.